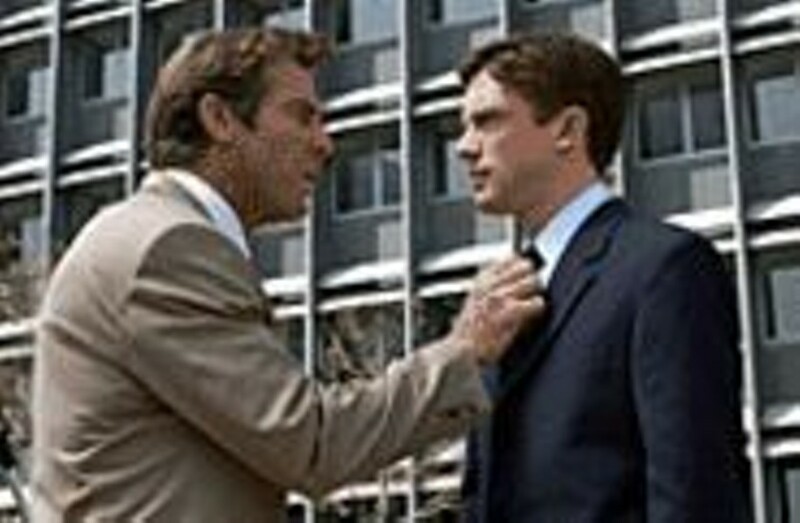 The measure of success: Dennis Quaid (left) and Topher Grace (right) make Good Company great. Paul Weitz, with brother Chris, co-wrote and co-directed 2002's adaptation of Nick Hornby's novel About a Boy, in which a cocky grown man (Hugh Grant) learned how to actually act like a grown man by observing a gawky young boy (Nicholas Hoult) who was nearly abandoned by his suicidal mother. About a Boy was one of those movies that, if it spoke to you at all, it shouted at you for days afterward. Lord knows how many men sidling toward their 30s or having just fallen over that precipice walked out of that movie believing it was about how terrified they were of committing to a relationship, how freaked they were at the thought of settling down and how frightened they were of having children and growing, God forbid, old. The brothers Weitz, previously makers of puerile good fun (American Pie), had grown up and asked their audience to follow them into adulthood, that treacherous territory where one can disappear forever into the quicksand of love, faith and accountability. In Good Company, Paul's marvelous comedy tinged with substantial sadness around its edges, suggests what About a Boy might have been like had Grant's character acted his age and given something back to a world from which he only took and took. This movie is about a man -- men, actually, one of whom, a sports-magazine ad salesman named Dan Foreman (Dennis Quaid), has everything the other, Carter Duryea (Topher Grace), desires but has absolutely no idea how to attain or even ask for. Carter, Dan's new boss and the younger of the two by some 25 years, believes he has it all -- a beautiful wife, a new Porsche, a bright future as a multinational conglomerate's rising star -- only to realize it's meaningless. In short order, Carter will lose his wife of seven months (Selma Blair), his car will be totaled before he's even out of the dealer's parking lot, and he will realize you can never be a boss when you work for lunatic billionaires who buy and sell companies for kicks. And yet the world believes men like Carter have it all, when even Carter doesn't buy it. And then there is old man Dan, with his beautiful wife, Ann (Marg Helgenberger), and their two daughters, college-age Alex (Scarlett Johansson) and high school student Jana (Zena Gray), and their lovely home in the suburbs. Dan wants only one thing now: to keep his job after media kingpin Teddy K. (Malcolm McDowell) buys the magazine and Dan's replaced by Carter, who once impressed the boss by selling cell phones to toddlers. The boss man has been demoted to "wingman," as Carter puts it so glibly and so smugly, just as Ann's dropped the baby bomb and Alex has decided to transfer to expensive New York University. Dan does what a man of responsibility must: He grins and bears it, for the sake of his family and at the expense of his ego. In Good Company is about many things: a love affair between Alex and Carter that occurs beneath Dan's nose, the burgeoning father-son relationship between Carter (whose junkie dad disappeared when he was a boy) and Dan, the fear of losing your job with a kid on the way, the desire to please a boss who doesn't even know your name. There's something terribly old-fashioned about it -- a colleague shrugs that Dan reminds him of a character Jack Lemmon would have played decades ago -- but that's never a bad thing; it is moral but never condescends, and it espouses decency without proselytizing. But In Good Company, with its talk of synergy and globalization, is also remarkably prescient, too -- like a Wall Street Journal headline. The film is ultimately so extraordinary because it deals with something so ordinary: the desire to be better than we are, without knowing how to do it. As Carter, Grace is jittery and anxious, not only because he's "scared shitless" of a job he has no idea how to do, but because he knows there's nothing in it for him save for a paycheck. In Dan he sees purpose and principles; in himself, he sees only squandered promise. Quaid, whose infamously wicked grin now resembles a forced smile, is equally touching as a man struggling to hold on to his pride -- an affliction that spreads throughout the office, from arrogant higher-up to lowly account exec for whom a firing can be emasculating (David Paymer especially is painfully real as the husband ashamed of telling his wife he's lost his job). The man who made A Boy has matured into a deft filmmaker with a gentle but confident touch. Weitz contrasts the lives of Dan and Carter by revealing them as parallel lives: When Carter's using his MasterCard to pay for an expensive meal, Dan's using his to pay for maternity clothes; when Dan's signing his second mortgage, Carter's signing his divorce papers. What could have been a calculating stunt works, because these are mundane moments in the everyday lives of people who sit in the cubicle or office next to ours; they're us, and we're them. Even a scene in which the sound of Carter's broken heart gives way to Ann's fetus' beating heart -- then Dan's racing heart -- works. Weitz doesn't manipulate, because he loves his characters, and his audience, too much to ever betray them.